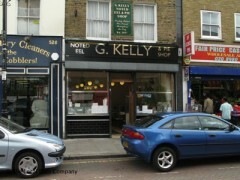 About: G Kelly is a British cafe/restaurant serving traditional East End dishes including eels and pies. When G Kelly opened in 1937 the aim was to provide a hearty lunch to the local market traders on Roman Road. Nearly 80 years later they continue to make pies fresh each day, as well as hot and jellied eels to hungry Eastenders, although their one concession to modern times is the meat-free pie made with soya mince. Add more details about your restaurant or tell us about incorrect details using these buttons.